Learn more about returning gear? Home » Learn more about returning gear? Don’t be afraid. Everything is easy and simple! Please pack everything back to our delivery bag. Just pack everything quickly into the bag like you go to a laundry. Attach your personal prepaid shipping voucher to the package. It is simple and super easy if you use our prepaid shipping voucher because its fully prepared and you do not need to fill in anything at all. You do not need to pay extra money to return gear if you use our the shipping voucher. 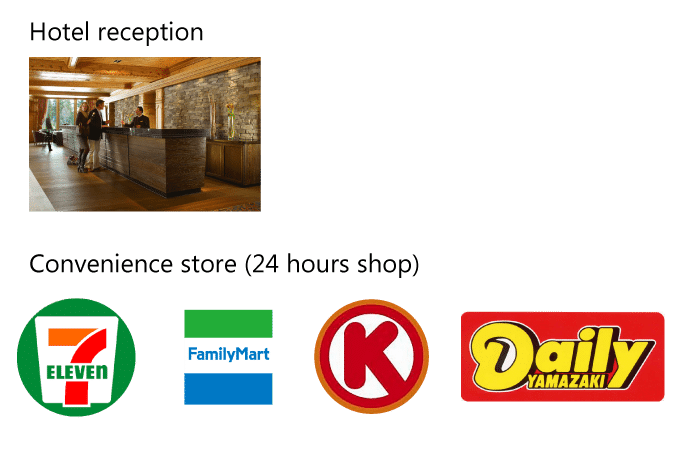 Hand your gear package in the MORNING HOUR BY LUNCHTIME(NOON) to hotel reception or to Convenience store(24 hours shop) like Seven Eleven etc. Returning due date is specified in every package. There are hundreds of thousands of convenience store are existing in Japan. Only with 7-Eleven, there are about more than four hundred thousand stores. Even if one of them does not accept shipping, you will easily find another store within walking distance. You will find this “black cat logo” at the entrance of a convenience store door, The cat logo means that the store is accepting delivery with your prepaid shipping voucher. >>> Learn more about Yamato Ta-Q-Bin service? click here. You can hand your used gear to these places below. They will handle the shipment to KOBE OUTDOOR, so please simply hand your bag and the voucher.